Original description of the Masters of Science Tapestry. 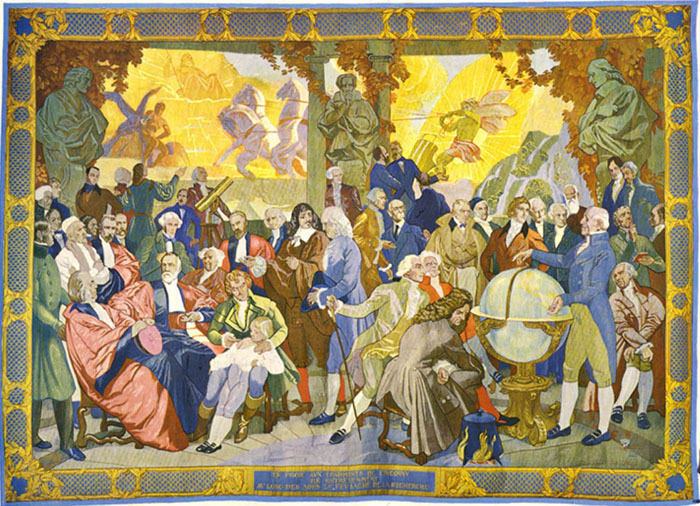 "Tormented by the unknown, they keep the sacred fires of research burning throughout the ages"
"En proie aux tourments de l'Inconnu ils entretiennent au long des ages le feu de la Recherche"
This tapestry, worked in 1948 in a special workshop opened at Colombes particularly for the weaving of several models representing different scenes such as: Masters of Science--Masters of the Spirit-- Springtime--Water and Fire--The Harvest--The Dance--The Chase. The workshop at Colombes was directed by M Guillaume Janneau, administrator of the Gobelin tapestry works. Numerous designs were drawn by O.-D.-V Guillonnet. M J. Cochery, workshop head at Gobelins, was the weaver.